If you are familiar with feng shui, you know how important the front door is to the wellbeing of a home. The front door serves as a powerful gateway between the outer and the inner world energies. As such, it should be attractive, inviting, and easy to access. If your front door faces southeast, choosing the right color for this direction will help direct positive energy to this central portal to your home and home life. In feng shui, the front entry is considered the mouth of Chi, or Universal energy, because it is through the front door that the house absorbs most of its energy nourishment. The higher the quality of energy the house (or office) can absorb, the better the quality of energy that is available to the people who live or work in the space. The easiest way to create a strong feng shui front door is to find the appropriate feng shui design for it— be it in colors, shapes, or materials. This is done by nourishing the feng shui element that corresponds to the direction your front door is facing. A southeast, or southeast-facing, door is a door with a compass reading from 112.5 to 157.5. (Tip: You can determine the direction your door faces using a compass app on a smartphone or a conventional compass). The feng shui element of the Southeast direction is the Wood element, and the corresponding feng shui bagua energy is money & abundance. The wood feng shui element colors are green and brown. In the case of a southeast-facing front door, you have additional color choices because there are two more elements—Water and Earth—that bring good energy to this area. These two elements are both nourishing and supportive of Wood, so you can use their colors, too, for your Southeast-facing front door. The Water feng shui element colors are blue and black. The Earth feng shui element colors are very light yellow and all earthy or sandy colors. Keep the door area free of clutter, both inside and out. Maintain the door so that it opens smoothly and without catching or other hindrances. Use the front door as your primary access point to the house; positive energy will do the same. Decorate the door and surrounding area so the entry is inviting and is clearly identifiable as the home's main entry. Promote Earth and Water energies with surrounding stone or other earthy materials or by adding a water feature, such as a fountain, nearby. 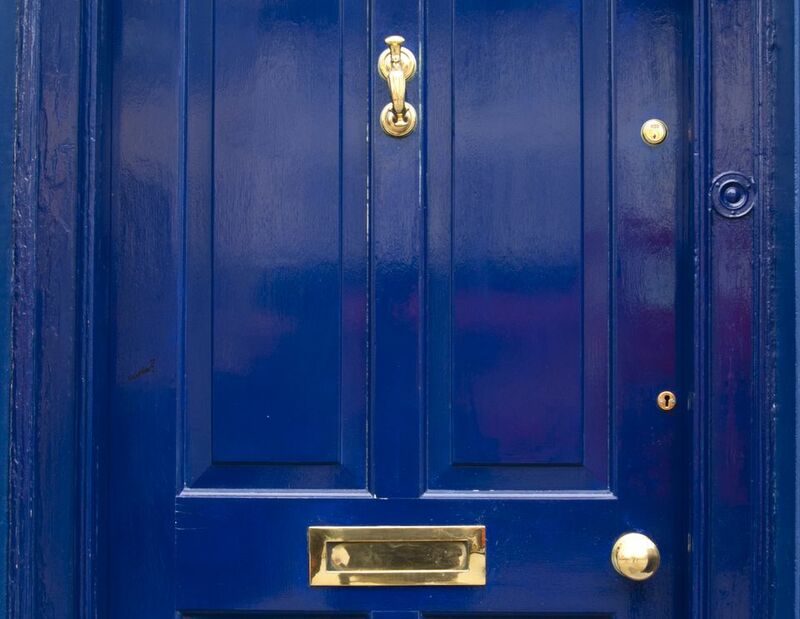 What Are Some Feng Shui Tips for a Strong Front Door?